Tree squirrels inhabit almost all parts of Indiana. The four types of tree squirrels found in the state are the fox squirrel, the gray squirrel, the red squirrel and the southern flying squirrel. Tree squirrels are interesting animals, but in urban and suburban areas they sometimes can be pests. Fox squirrels, the most common of the tree squirrels, are found throughout Indiana. Gray squirrels are found throughout the state but are most common in areas of central and southern Indiana, especially along the Ohio River. Red squirrels, or “pineys”, are found in central and northern Indiana. Flying squirrels are the smallest of the tree squirrels, the least common, and the only nocturnal tree squirrel (although fox squirrels have been occasionally noted to exhibit nighttime activity). They are found in isolated populations around the state. Tree squirrels feed on a variety of material; nuts, fruit, seeds, berries, insects and bark make up the bulk of their diet. Nesting sites include tree cavities, old woodpecker holes, attics, etc. If such places cannot be found, tree squirrels will construct leafy nests in the branches of trees. Tree squirrels sometimes become pests in urban areas. They may eat pecans, fruits, berries, bird seed or vegetables in home gardens, or may nest in attics. Sounds of running or gnawing coming from the attic during the day often indicate the presence of squirrels whereas running, squealing and gnawing sounds at night generally indicate the presence of rats or raccoons. Squirrels can cause extensive damage to the insulation in the attic or walls, and also may gnaw and damage electrical wiring. During winter, tree squirrels may damage trees and other ornamental plants by eating the bark off the limbs. Where squirrels are a problem, several things can be done to discourage them. 1 1/2 to 2 1/2 pounds. Brownish-gray with an orange or creamy underside. 7 to 14 inches, bushy. One to two per year, usually born in March or April and again in August or September. 7 to 10 inches, bushy. One to two per year, usually born in September or October and again in February or March. White belly and a top coat that is dull reddish gray in the summer and brighter orange-red during colder seasons. Usually one per year, can occur spring through fall. Grayish to brownish, underside is creamy white. Avg. 3-4, but up to 7. Two if conditions are optimal. Making trees, attics and buildings squirrel proof is a permanent solution to the problem, does not harm the squirrels, and presents no legal difficulties. Squirrels usually gain entrance to attics and other structures from the roof, especially if tree limbs overlap the roof line. This problem can be solved by trimming tree limbs back at least 8 to 10 feet from the roof. If this is not possible, sheet metal bands can be placed around the trunks of the trees to discourage squirrels from climbing them. The bands should be about 2 feet wide and 6 to 8 feet from the ground. This method is especially effective when a single tree provides access to the roof. If squirrels can jump from tree to tree, however, this method may not be effective. If this is the case, an effort must be made to exclude them from the attic. Squirrels usually enter attics through vents, which often are not adequately screened. However, they will sometimes gnaw their way into the attic. All points of entry must be sealed if the squirrels are to be excluded. Sheet metal, hardware cloth, and steel wool are effective materials for sealing the openings. An entry point often overlooked in squirrel exclusion is the chimney opening. A pre-made chimney cap available at most hardware stores is the recommended and safest exclusion method to seal an open chimney. The openings should not be sealed until the squirrels are out of the building. This can be accomplished by installing a simple one-way door. This door will enable squirrels to leave the building, but not to reenter it. Cage traps can be used to reduce local squirrel populations or to remove individual squirrels from an attic. Effective baits include fruit, peanut butter, nuts, seeds and vanilla extract. Cage traps are available from hardware or feed stores. At present there are no toxicants or fumigants registered for use against tree squirrels in Indiana. Registered commercial repellents are available. It is not advisable to shoot squirrels in urban areas because of the danger to other animals and people. Also, most cities have ordinances against discharging firearms within the city limits. 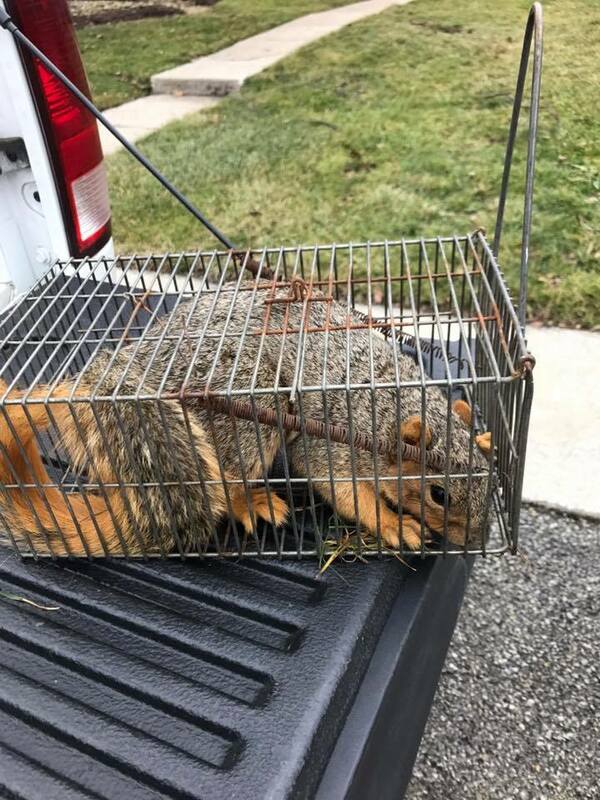 Fox squirrels and gray squirrels are classified as game animals in Indiana, but can be legally cage-trapped by landowners or their tenants in areas where they are causing damage or creating a nuisance. Red, or piney, squirrels are not regulated, and therefore can be legally controlled at any time during the year. Flying squirrels are a protected species and cannot be taken without a permit from Indiana Department of Natural Resources Division of Fish and Wildlife. Under state law a landowner or tenant may take fox, gray and red squirrels at any time if they are causing damage. Fox and gray squirrels can also be taken during the hunting season with a hunting license. Trapped squirrels must be relocated within the county of capture or euthanized. Permission from the property owner must be obtained prior to releasing an animal on their property. Homeowners who have trapped and relocated/euthanized fox or gray squirrels must report it to IDNR within 72 hours of capturing or euthanizing the animals. Such reporting is not required for red squirrels. Contact IDNR Division of Fish and Wildlife at (317)232-4200 for permits regarding the control of flying squirrels. Individuals with nuisance wild animal control permits can assist homeowners with nuisance squirrels. The names of licensed nuisance wild animal control operators and additional information can be obtained from the Indiana Wildlife Conflicts Information Hotline at 1-877-463-6367.